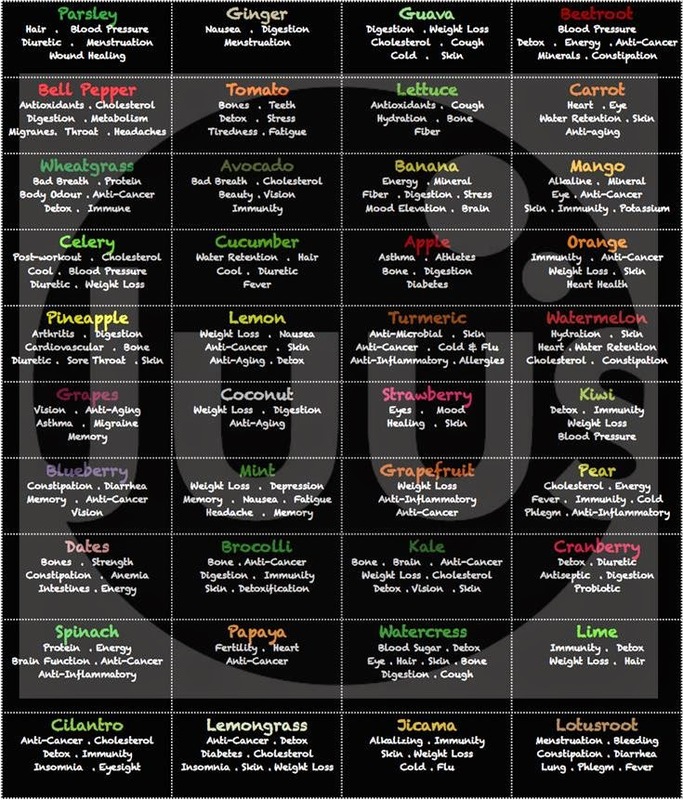 Cold-pressed juice bars are aplenty in town, but have you ever wondered what's exactly inside the juice that you're splurging for? 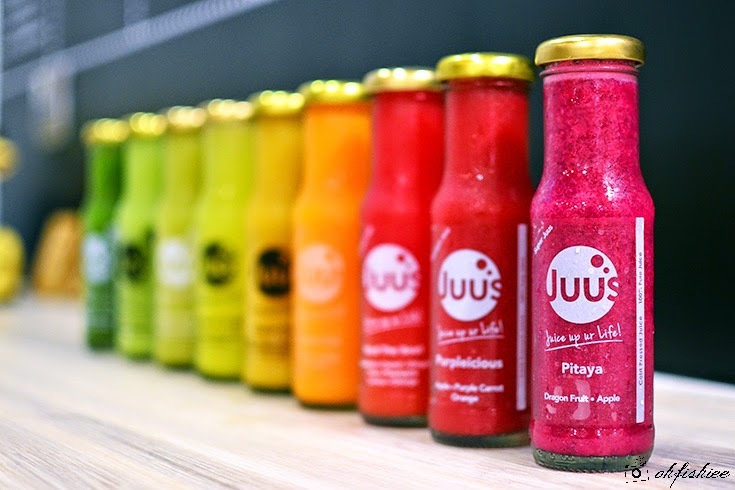 Many thought that the juice is an instant vitamin boost to our bodies, but JUUS Juice has proven to us that the health benefits of its premium juices go beyond that. 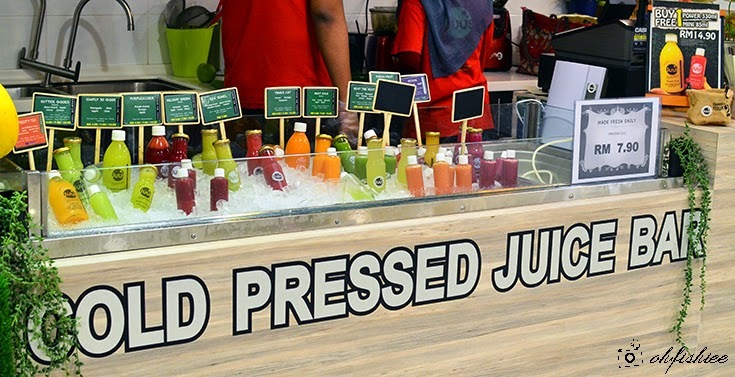 Located directly opposite Celebrity Fitness at The School, Jaya One, this relatively new kid on the block offers cold pressed juices that are freshly made daily from raw vegetables and fruits without adding any sugar, artificial flavouring, colouring and preservatives. Just enjoy the natural sweetness from the natural, pulp-free and enzyme-rich concoction itself. 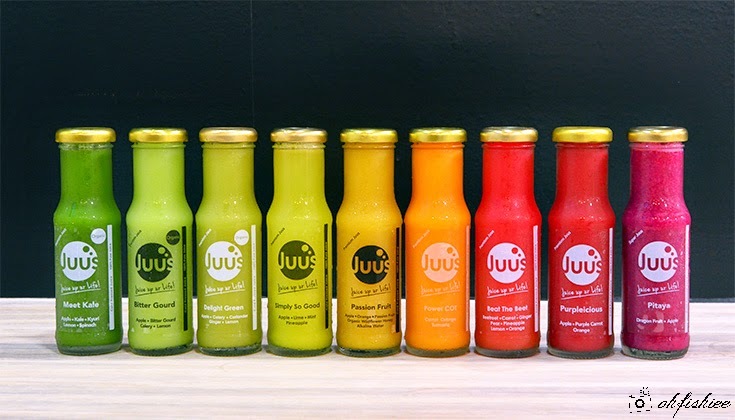 What makes JUUS stands out from the rest is the creative recipes that can blend up to 9 types of fruits into one bottle! 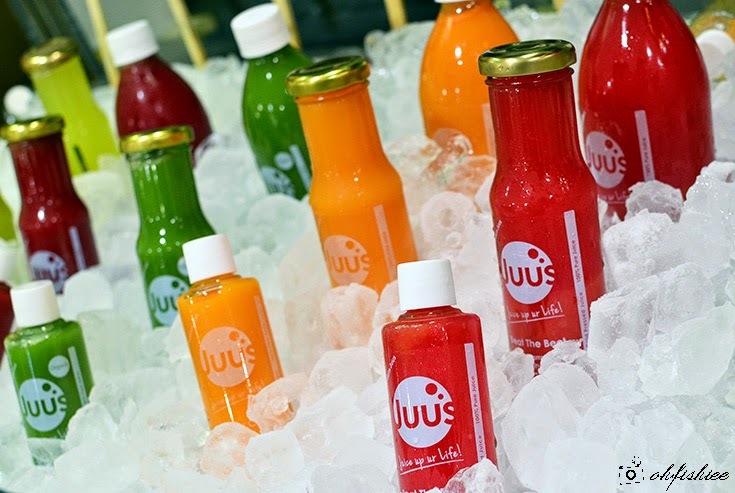 JUUS divides its juices into 3 main categories-- Simple Juus (1 type of fruit), Super Juus (2 types of fruits) and Premium Juus (3 to 9 types of fruits!). In fact, the juicy combination here is endless because you can create your own flavour by choosing up to 4 types of fruits or vegetables. 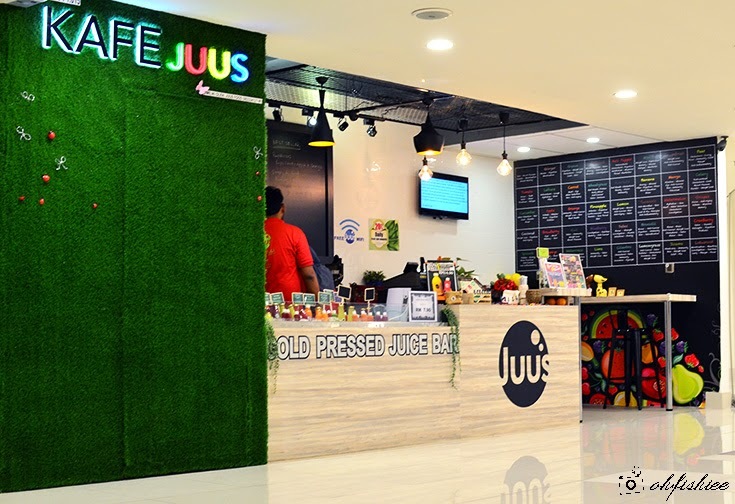 If you are new to juicing, do try out the Juus Tea that blends fruit tea using organic green tea and many citrus fruits, as well as Milky Juus such as Almond-Avocado Milk and Hazelnut Milk. 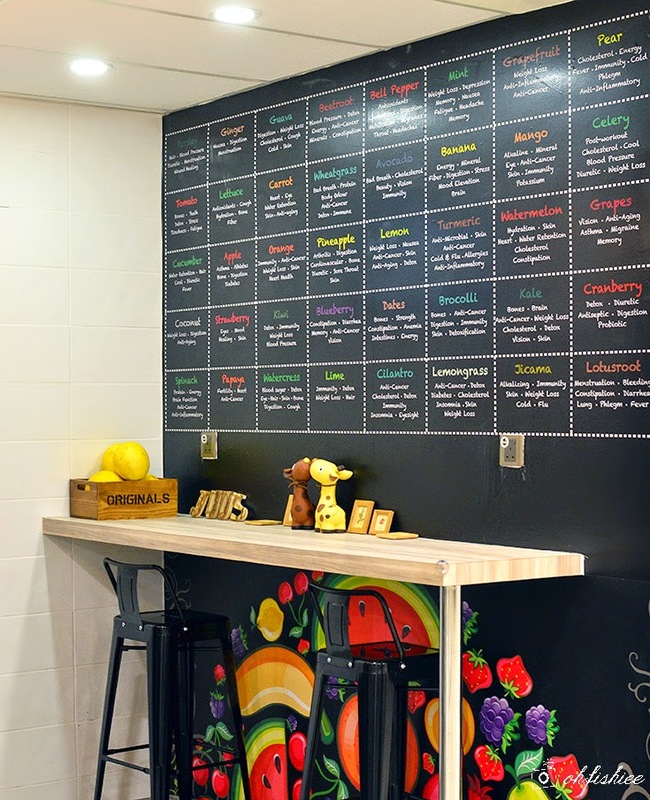 While enjoying your glass of juice in comfortable seating and with free WiFi, do spend a couple of minutes on the colorful nutritional table on the wall. Not only you are feeding your body with enzymes that aid digestion, but also other natural nutrients that benefit your body from head to toe. For instance, ladies should go for beauty juice such as Beat The Beet (Beetroot + Carrot + Ginger + Pear + Pineapple + Lemon + Orange) for its anti-aging benefits. Beet juice can reduce the appearance of wrinkles by as much as 60%! Imagine eating a whopping 1kg of green veggies daily, it is a lot easier to drink enough greens to get the same nutrient impact. Organic green juices are more oxygenating and give you clear skin and bright eyes. For people who dislike vegetables, a blend of cucumber, kale, apple, spinach and lemon is a nice, easy way to start. This anti-inflammatory, beautifying and energizing turmeric orange carrot juice will do wonders to your digestion and energy levels. Bold color and big nutrition. This juice is loaded with some richly colored carrots, kicked up with turmeric and then smoothed out with oranges. There you go towards glowing skin! Among the crowd's favourites, Simply So Good is a refreshing, tangy concoction that tastes smooth on the palate without being too minty. 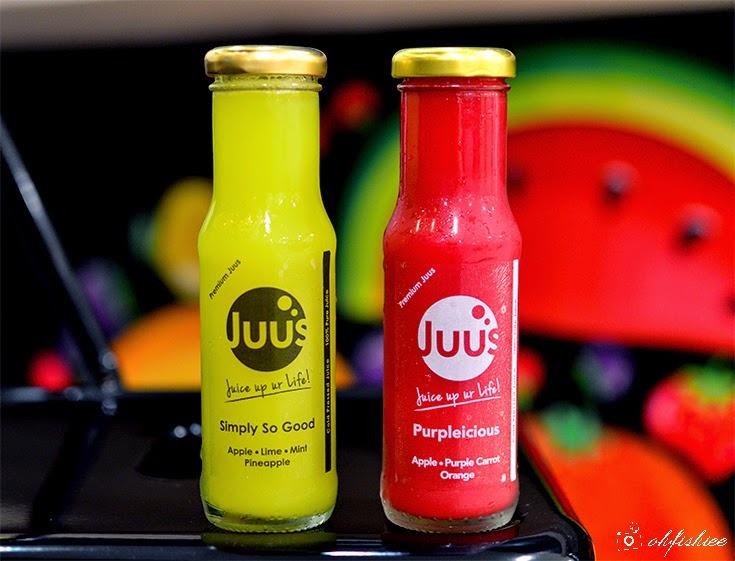 Speaking of top-notch quality ingredients, JUUS uses Purple Carrot, one of the most amazing superfood to make its best-selling Purpleicious juice that is packed with antioxidants. A pink Pitaya blend of dragonfruit and apple is great if you like a sweeter drink. 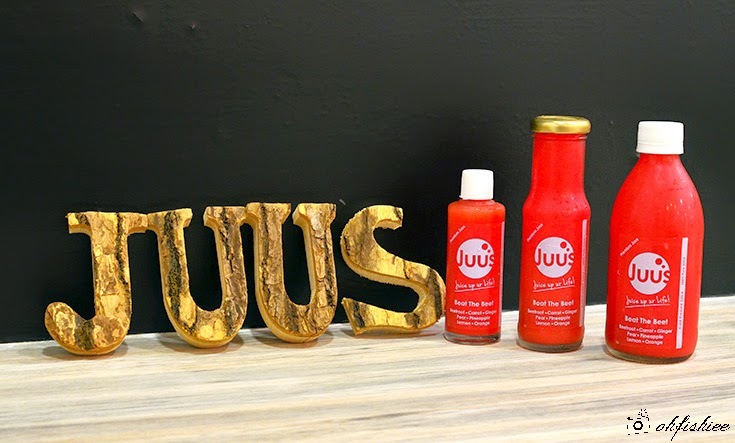 JUUS is serious in delivering only the best to the customers. It insists on using only sterilized glass bottles with locked cap to store the juices for ultimate freshness and greatest nutrients. Since it is raw and unpasteurized, always refrigerate it and consume within 48 hours. 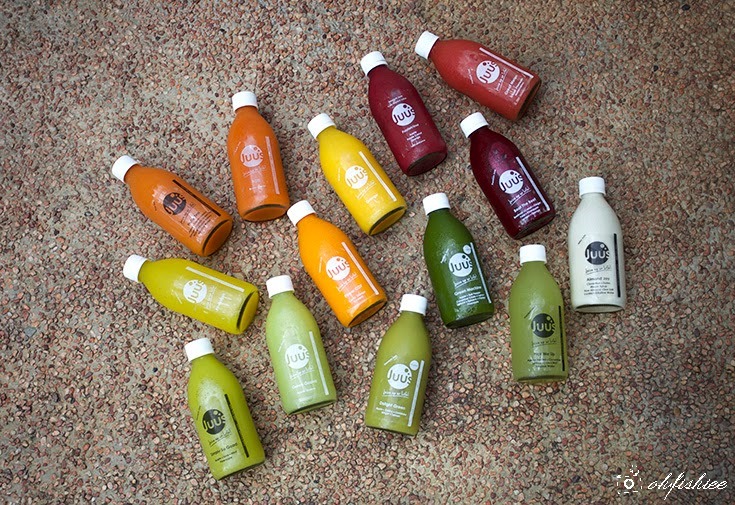 Each flavour comes in 3 sizes-- Mini (RM4.90 for 85ml), Midi (RM7.90 for 150ml) and Power (RM14.90 for 330ml), and you can sample on them at the juice bar before deciding on which to purchase. 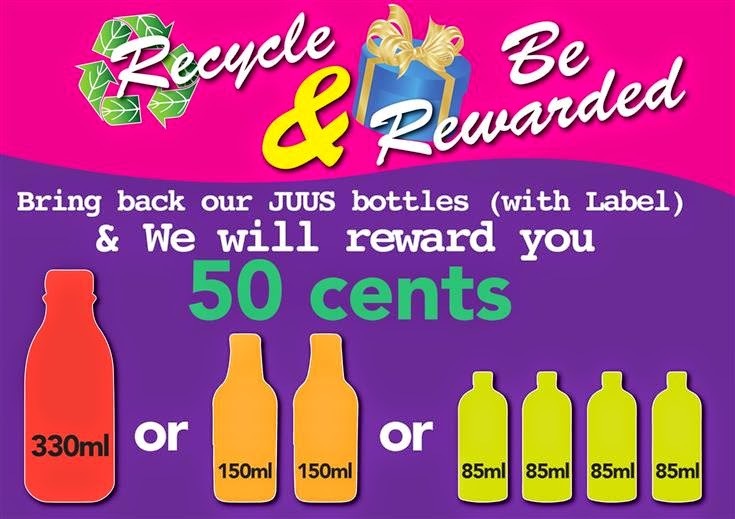 Don't forget to bring back your JUUS glass bottles and exchange for cash! 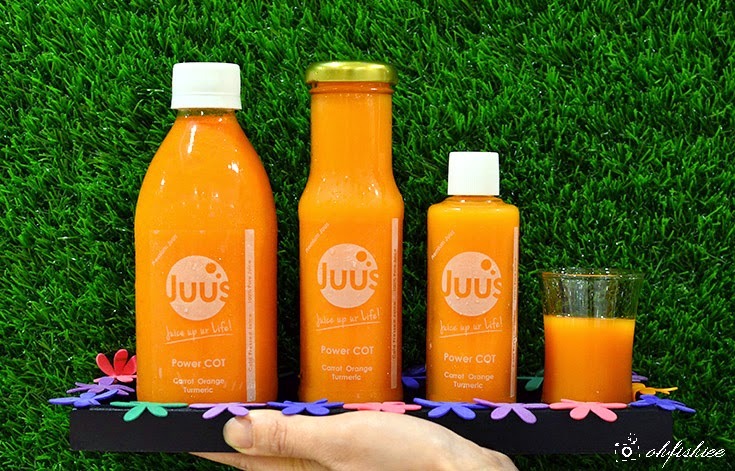 JUUS' juice detox programme is coming up very soon. 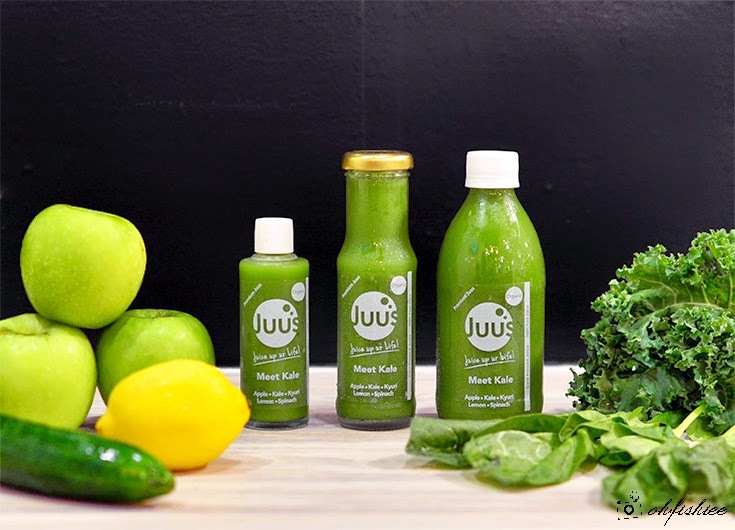 At the mean time, feel free to drop by and pick up your delicious juices at Jaya One or have them delivered to your doorstep (Within PJ area).